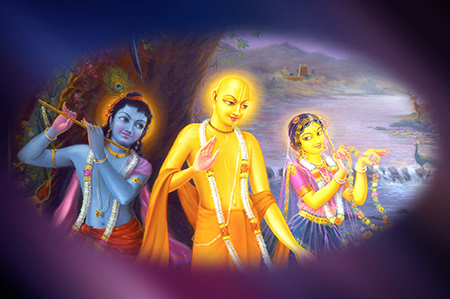 Gaura Purnima marks the appearance day of Lord Chaitanya. After Janmashtami, Gaura Purnima is the most important festival for Vaishnavas who follow the teachings of Lord Chaitanya. Gaura (golden) refers both to the golden complexion of Lord Chaitanya and to the golden hue of the purnima (full moon) under which Lord Chaitanya appeared. Narottam Das Thakur, a great devotee of Lord Chaitanya inaugurated the first Gaura Purnima festival after the disappearance of the Lord, in Kheturi gram, Bengal.In the ISKCON Mayapur temple, near Lord Chaitanya’s birthplace, the festivities extend over a month and devotees come from different countries to participate in the spiritual, cultural and educational events organized. In Nasik, this grand event is celebrated with an evening festival of lecture, drama and wonderful kirtan. Kirtan is the loud chanting of the maha-mantra Hare Krishna Hare Krishna Krishna Krishna Hare Hare Hare Rama Hare Rama Rama Rama Hare Hare taught by Lord Chaitanya as the easiest yoga process for the age we live in. A sumptuous feast is served after the programme and Lord Chaitanya’s birthday cake is distributed to all those present. This festival takes place in March/April and signals the beginning of the Vaishnava calendar. Devotees fast until moonrise. 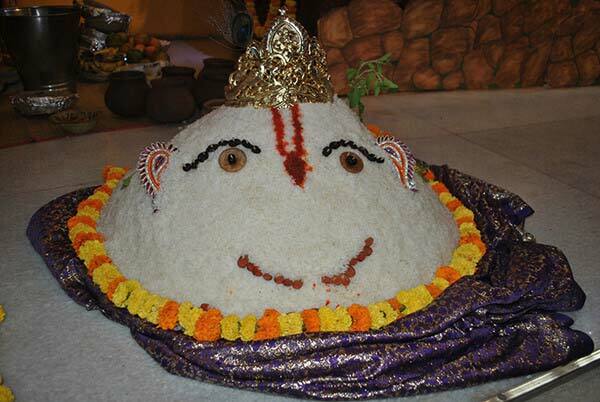 ISKCON temples across the world celebrate Govardhan puja annually by decorating and worshipping mountains of foodstuff which symbolize Govardhan mountain. All day, there are readings from the Krishna Book and bhajans in the temple room. In the kitchen, devotees prepare a big feast of at least 108 varieties of preparations to be offered to Krishna at midnight. Nearly 9,00,000 devotees visit the temple this for taking the Darshan of their Lordships for Krishna Janmashtami. A 50 000 square foot main tent is erected for the main evening programme of kirtan, bhajan, drama, dance, lecture and abhishek. A guest speaker is invited from overseas for the occasion. Smaller tents host booths explaining our philosophy, presenting local projects, and selling sweets, savouries, books, CDs and cassettes, and other devotional paraphernalia. We also have booths for children and a big prasadam tent, serving a free hot meal to all our guests. For the inquisitive young visitors, at ISKCON Nasik, we offer a special tent hosted by the ISKCON Youth Forum. They offer transcendental fun like you’ve never tasted before: chanting Hare Krishna , dramas and cultural programs. The grand abhishek (bathing the Deity with auspicious substances) which is at 11.30 p.m and the midnight arati are highlights of the evening tent programme. Fasting is until midnight. Devotees break their fast with ekadasi prasadam and get ready for the next day, which is Srila Prabhupada’s Appearance day festival. 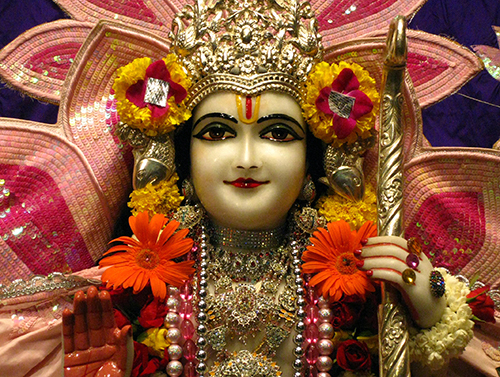 Radhastami is the celebration day of Srimati Radharani’s appearance. Radharani is the consort of Krishna. She appeared to Vrishabhanu Maharaj (her father) in the village of Rawal a fortnight after Krishna’s appearance. Radharani’s special qualification is that She is the best devotee of Krishna. Krishna therefore loves Her the most. On Her festival day, devotees seeking Krishna’s grace will especially ask Her to grant them devotion to Her beloved Lord, knowing that if they can attain Her favor, they can attain His as a natural consequence. 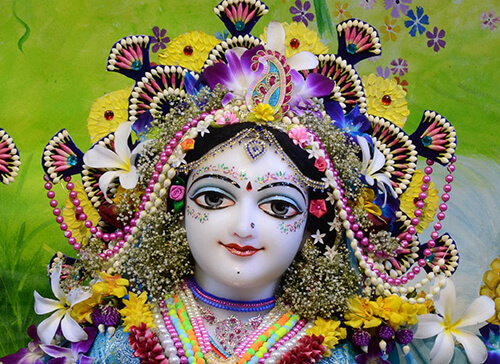 On Radhastami, Sri Sri Radha Krishna deities are traditionally dressed entirely in flowers. 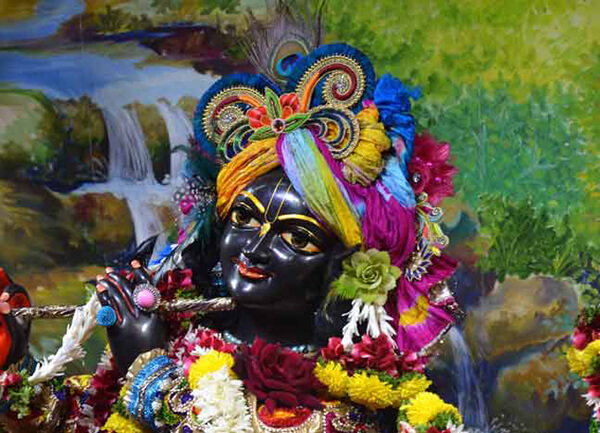 Sri Sri Radha Rasabihari are offered a new outfit in the morning and adorn a flower outfit in the evening. The festivities on Radhastami includes darshan of Sri Sri Radha Rasabihari in new outfits, spiritual discourses, kirtans and bhajans, maha-abhishek, maha-arati and offering of hundreds of bhoga foodstuffs to Their Lordships. The special highlight of the day is a magnificent boat festival where the Utsav-murti of Sri Sri Radha Rasabihari are taken on a flower bedecked silver boat in the temple courtyard. Lord Ram is the most popular incarnation of Krishna. His transcendental adventures told in Valmiki’s Ramayana are famous throughout the world. Lord Ram was the ideal monarch and his virtuous life is a perfect example for everyone in family life to follow. Narrations of his affectionate dealings with his family and devotion to His wife, Sita Devi, have enchanted generations of devotees. Lord Ram’s worship is very popular in Mauritius and almost every Hindu is a Hanuman bhakta. Hanuman himself was a great devotee of Lord Ram.